Greg Minikin dives over for a try in Castleford Tigers' game against Leeds Rhinos. Minikin has struggled for consistency so far this season and was left out of the 17 for the Wigan Warriors game last week. 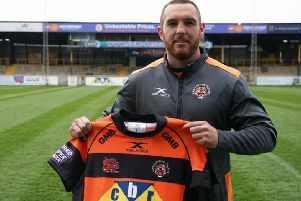 But with spots in the team at right centre and right wing still up for grabs Powell believes the player he signed from York can still play a big part if he can get his confidence back. He said: “Greg wants to play in the centre and that was his position when he was at York. He did a pretty good job there. “He’s done well for us. He’s played against Kallum Watkins when he was at his best and completely shut him out so he can play there and do a great job. He’s just got to build his confidence and it’s down to him to prove it because there’s a challenge every week on the rugby league field. 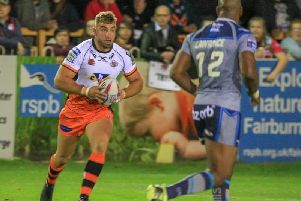 Minikin is out of contract at the end of the year, but Powell would like to keep him at Castleford. He added: “He’s out of contract at the end of this year, but we’re in discussions with him.